Now that we have a deeper understanding of why customer loyalty is important and how it can add value for your business, it’s time to layer on an additional understanding of how you can appeal to your customers to build loyalty. What does make a loyal customer, and how can you create it within your product? Oftentimes a customer has multiple different options when it comes to what product they want to use. While things like price often have a play in it, the most important things to a customer are cultivating trust and providing consistency. Take this story from Len Markidan from Groove, for example. He went to the same corner barber shop near to his house with regularity. It was a pretty normal barbershop—nice chairs, free drinks, friendly staff—so he always knew what to expect. He always had the same barber with whom he conversed with easily. Then, one day, he overheard another client talking with their barber about a new product that had just come in. Thinking back to the messy mop of hair that revealed itself every time I took my own beanie off, I was sold. Len left the interaction with a high level of trust and continued to return back to that barber shop even when it was no longer convenient and there were other barber shops nearer to him that he could go to instead. What’s the most valuable takeaway from this story? Honesty is incredibly important with your customers. Len knew that that barber could have earned a commission if he had sold him the fancy hair paste, but he chose not to and instead guided him in a direction that would work best for him. It wasn’t just that his barber did his hair consistently well, but that he had Len, the customer’s, best intentions in mind. When customers reach out to you, start by being honest. If your product isn’t a great fit, or you don’t do exactly what they want, tell them that from the get-go. Either you’ll have a group of well-informed customers using your product that knows exactly what they’re getting into, or you’ll have people leave because it doesn’t fit their needs. Either way: you end up with customers that are a good fit for your model, and are already starting off on the right foot to becoming loyal, long-term lovers of your product. TOMS shoes champion their One for One movement, which gives a pair of shoes to a needy person in the world for each purchase. Zappos has built their core values around “WOWing” customers, placing service as their #1 priority. Timberland emphasizes their G.R.E.E.N Standard, which aims to place profitability and community service on the same team. By including strong value propositions like this in their brand identity, these companies automatically attract customers that align and feeling strongly similar thus pushing them forward towards becoming loyal customers. People want to spend their money and their time with people who have similar values to them, so stand behind whatever you set for your company—there’s only one thing worse than having no values, and that’s switching your values regularly and not giving anyone the time to identify with them. According to Greg Ciotti of Shopify, the #1 thing that creates loyalty in anybody (and that includes your customers) is the social construct of reciprocity. Reciprocity is the idea of give and take within human interaction—for example, if you are offered kindness, you are compelled to give it back—and it’s one of the single defining aspects of social interaction. One-to-one reciprocity is most applicable to customer support and customer success—many ot the interactions between your customers and those teams are going to be impacted by winning their thanks on individual terms. So, providing excellent service, helping them with one-off needs, or coaching them through best-practices are great ways to promote loyalty via one-to-one reciprocity. That being said, there’s more impact to be made by one-to-many reciprocity. A good example of this is Zappos. On their shipping page, Zappos writes that the customer’s order will be there in 2-3 business days. But, without telling them, Zappos upgrades every customer order to priority shipping (usually overnight) without letting them know. Talk about surprise and delight. This is a great example of one-to-many reciprocity done through automation with a high impact on customer loyalty. People love to hear the sound of their own name, and they love to know that someone is thinking about them and values them. There was a study published in the Journal of Applied Social Psychology that followed servers at a restaurant and tried to uncover if there was any specific customer response to them offering mints after a meal. It turns out that if they offered a mint with the final check, they were rewarded with a 3% boost in a tip; if they brought mints in hand and asked if anyone would like a mint, tips were boosted by 14%. If they brought out mints with the check and then also came back out later with more mints, asking if maybe someone wanted another, the tips went up by 23%. Holy cow. 23%! The main difference between the two groups was personalization. The customers of the servers in the last group felt that they were cared about because the servers came back around another time just to confirm that they had all of their needs met. The ones in the second group were offered the same amount of mints, but without the experience of having someone follow up with them to offer them. For businesses that need to build loyalty with customers in the SaaS industry, personalization is also effective. After they’ve signed up for your product, reach out to them with personalized content or an experience outside of what you would normally offer (or what they’d normally expect). This could be a private webinar that normally you only offer for paid clients or a walkthrough of a system that they’ve expressed interest in with a salesperson or customer success team member. If you reach out after the first sign up asking if they need something, or offering something they might not know that they need, you’re building a customer for life. Too often people let policies become a barrier to offering an excellent customer experience. A great example of this is refunds or store hours such as at the Apple Store or Nordstrom’s. When a customer shows up frantic, whether it be to an in-person establishment, or online in your chat, email, or phone queue, it’s because they need your help. They are not trying to be a nuisance, and they are not trying to break a policy or rule—they are coming to your company because they need help with something that you built. The next time a customer comes to you with a need that goes outside of your company policies, evaluate the cost of what they are asking for versus the cost of losing their loyalty, or their business entirely. For example, say a customer reaches out and says that they need to cancel their account because their business is closing, and they no longer have enough money to pay. You go and look into your payment processing system and see that because you have a recurring billing system, they’ve been charged for months, but haven’t been using your product at all. So, instead of just canceling their account, you also refund them for the past three months of billing that you’ve issued and asked if there’s anything else you can do to help - even though they didn’t ask for a refund. That customer, even if they are currently out of business, is certain to tell everyone about the amazing thing that your company did for them in their moment of need, and will most definitely come back to you when they are at a more stable company or have reopened their business. No one knows your product better than you. While that is really awesome, it’s also important to remember when you are trying to guide a new or unfamiliar user through it. While you may know where things are or how things work like the back of your hand, your customers don’t, and sometimes they need a hint. 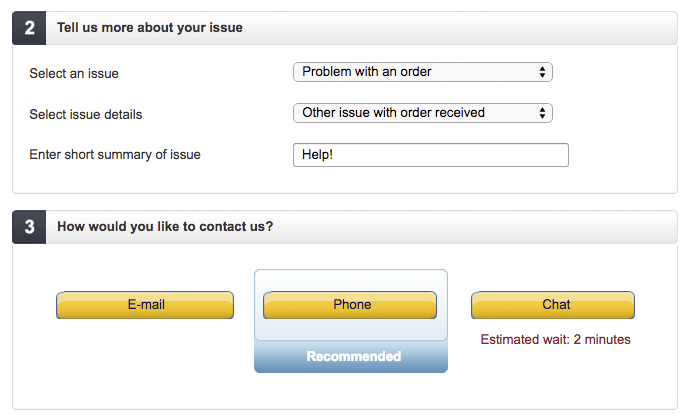 This could be in an onboarding flow, during sign-up, or even when a customer is first asking to contact you. For example, when you first contact Amazon, they prompt you towards the most rapid form of contact that is currently available to you. Another great example of leaving customer “clues” while they are getting started, is Slack’s onboarding flow. Slack walks the user as they’ve first signed up through all of the things they will need to know to use Slack successfully, such as setting up a username, team name, understanding how certain prompts work, and finally showing the difference between a direct message and a channel. With all of this training, the user is never just dumped in without any context and is better able to get started with using (and loving) the product. When you train your customers and offer them a better experience through small nudges like this, you use your superior product knowledge to give them an easier journey. Rather than just assuming that your customers will know what to do, come at their experience as though they are fresh, with brand new eyes, and have no idea what they are looking at—because that’s most likely to be the case.